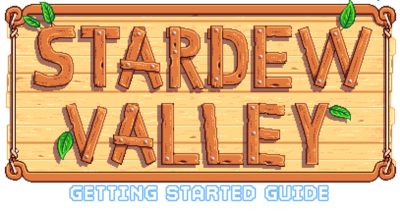 Stardew Valley is an open-ended game, allowing the player to achieve goals non-linearly. There are various ways to earn income and many activities to choose from including farming, fishing, foraging, mining, combat (fighting enemies), crafting, cooking, gift giving, completing quests, and restoring the Community Center. 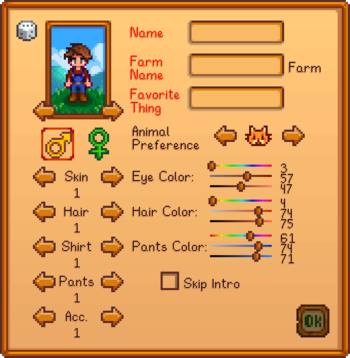 The character creation screen allows customization options, such as character Appearance, Gender, Name, Farm Name, Favorite Thing, and Animal Preference. There are 2 genders, 24 skin tones, 32 hair styles, 112 shirts, 20 accessories, and 2 animals to choose from. The sliders next to eye color, hair color, and pants color represent hue, saturation, and value. Animal Preference determines which pet will arrive on the farm later. Gender does not affect in-game marriage. Players can later change their appearance for 500g, in the Wizard's tower, after reaching 4 Hearts of friendship with him or gaining access to the witch’s home and using the portal within. Players can select from five different farm maps. Each map offers unique benefits, and favors specific skills. After selecting a map it cannot be changed, characters are permanently tied to their map type once created. Space wise each map takes up the same area, but there are different amounts of usable/farmable/buildable land on each. Use your axe, pickaxe, and scythe on the logs, stones, grass and bushes on your farm to clear about 15 tiles. Use your hoe to till the soil and plant the 15 Parsnip Seeds provided by Mayor Lewis. Use your watering can to water your seeds and soil. Continue watering your crops every day until they grow in to harvestable crops. Your parsnips will be ready to harvest in 4 days. Crops needs to be watered daily in order to grow. The starting watering can will only water one tile at a time and can be refilled at any pond, river, or other body of water. Crops will stay one day without watering, meaning they can be watered every other day without withering; however, crops will grow slower when not watered every single day. The best times to upgrade the watering can are the day before it is predicted to rain, as the rain will water the crops, or the 27th day of the season after watering any crops that are expected to ripen on the 28th. The Blacksmith will need 2 days to upgrade any tools, including the watering can. Sprinklers, which must be crafted and placed, will automatically water surrounding tiles every morning. Throughout the gameplay, sprinklers become available in 3 tiers that can water an increasing number of surrounding tiles, starting with 4 tiles (immediately adjacent to the sprinkler), 8 tiles (in the surrounding 3x3 area), and up to 24 tiles (in the surrounding 5x5 area). Energy limits productivity. One of the main ways to overcome this is by eating food. Eating food is an action, for which default controls are Right Click or type X with the food highlighted in your inventory and then click Yes in the confirmation dialogue to eat the food. Most crops and many foraged items can be eaten in order to regain energy. Sleeping at the end of the day will restore the players' energy. After 12:00AM, the player won't restore 100% of the energy. If the player is exhausted when they go to bed or forced sleep at 2:00AM, they'll wake up in the morning with their energy level about half restored. On the third day of summer, an earthquake will remove the rocks that block the path leading to the Spa (north of the Carpenter's Shop). The Spa will fully restore energy over a short period of time. To level up skills, the player must complete certain actions related to that skill. Farming XP is earned by fully growing a crop. Foraging XP is earned by foraging or chopping down trees. Mining XP is earned by breaking rocks and ore deposits. Fishing and using crab traps will increase fishing XP. As the skill level increases, the player will earn crafting recipes (every level except level 5 and 10) or professions (on level 5 and 10). Professions (level 5 and 10) can give the player a boost on yielding products, including more products gained, additional selling price, using less inventories and others. The players choice of a level 5 profession will determine which profession choices are available at level 10. Giving gifts to villagers will increase their friendship rating. You can give a gift by highlighting it in your inventory or selecting it by typing its hotkey number and then left clicking on the person to whom you wish to give the item. As friendship is earned villagers will send cooking recipes or food through the mail, give you access to their bedrooms, and treat you differently in dialogue. Unique cutscenes and interactions can also occur as friendship is earned. The player must also earn a high level of friendship in order to date, and eventually marry, an eligible villager. The television provides useful information, such as weather forecasts, fortune telling, free cooking recipes, and other general tips. All players will have one inside their home when beginning a new game. This page was last modified on 20 April 2019, at 02:56.